Best Time All Year To Get Out and Hike! If you haven’t gotten out and hiked a trail this week you’re missing some of the best views (and weather) all year. It is so green it’s almost overgrown in places. Starting at the trail head at the end of Franklin St. allows you a peek at the progress being made on the Wonderworld Extension. New fencing at the trail head signals future improvements to one of the most dramatic trails in San Marcos. 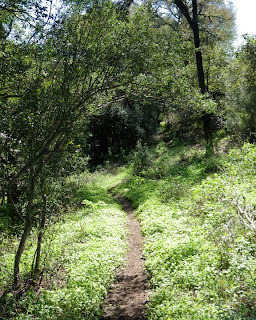 The 10-minute hike to Grandma’s Oak is a bare indicator of the flora and insects thriving along the trail. Birds are generally early morning or evening but now appear in greater numbers because of the water. 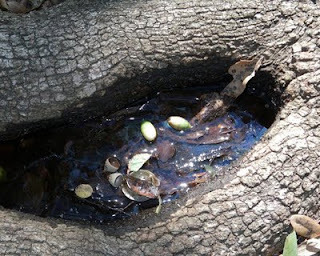 There’s actually standing water in this oak trunk from rain almost a week earlier and, if you walk the distance, more standing water (and mosquitoes) in Purgatory Creek below the bluffs. There’s an amazing overlook of approximately 80 feet followed by a meadow with all manner of late summer flowers with their attendant bees, butterflies and myriad other flying insects. Following the trail along the creek provides a view of impressive limestone bluffs with Turk’s cap growing along the feeder streams. The trail opens up again at the dam next to Hernandez Intermediate School. You can hike or bike the trail past the dam, but you’ll have to turnaround and re-trace your steps for a hike of approximately five miles.